Edward G. Robinson was flying high in 1939, confident and comfortable in his position near the top of the Hollywood heap. His box office appeal was such that he could be successfully cast in nearly anything, which possibly explains his turn in Metro’s seldom-seen Blackmail, which only vaguely resembles that other chain gang picture. An oddly cast Eddie plays John Harrington, a wrongly imprisoned man who escapes a Deep South chain gang and starts a new life with a new name—John Ingram—with his wife (Ruth Hussey, wasted here) and son (Bobs Watson) in Oklahoma as, of all things, an oil field fire fighter. Whenever a gusher turns into a flamethrower, John and partner Moose (Guinn Williams) swoop in with nitroglycerine, dynamite, and asbestos suits and blow the inferno to kingdom come. But after a newsreel crew records some of his exploits, John’s past comes back to haunt him and he soon finds himself returned to the chain gang, craving revenge against the man “old friend” (Gene Lockhart) who blackmailed and betrayed him. Robinson was still under contract at his home studio, Warner Bros. in 1939, and made this quick actioner on loan-out to MGM. Given the status of the performer and the studio, it’s somewhat surprising to see that Blackmail only rates 244 votes on IMDb. And while Robinson jolts any film he appears in, this is certainly one of his weakest star outings, and I spent much of my viewing time wondering if a different, and ugh—younger, taller—star, may have made for a better film. Nevertheless, at just 81 minutes this moves quickly and travels from location to location with the sort of polish that one expects from MGM—even MGM trying their best to do a Warner’s picture. The fire scenes are exciting and have a convincing sense of verisimilitude (not too much rear projection); the chain gang sequences somewhat less so, but only because they were created on the lot rather than in Louisiana, and because Eddie just can’t swing a pick axe with the same aplomb with which he brandishes a Tommy gun. However he does shine throughout the escape sequence, particularly when he clings desperately to the axle of a fruit truck as it barrels down a rocky unpaved road. It’s tense, scary stuff. 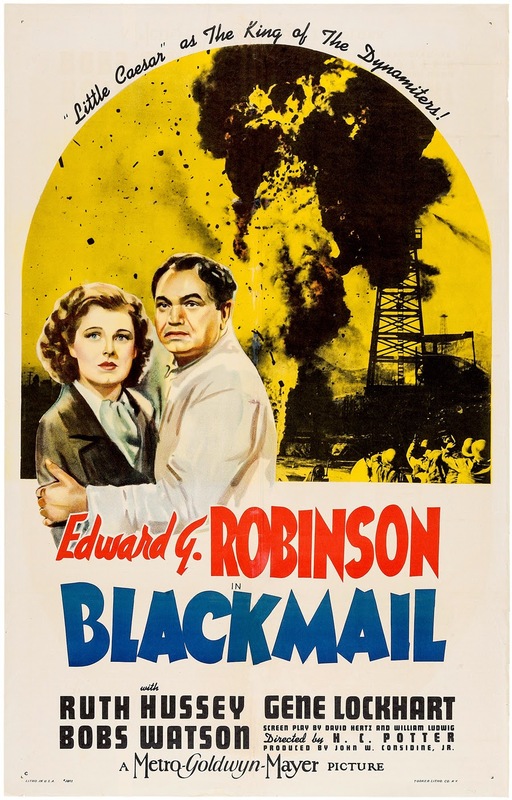 In the end Blackmail is an only mildly striking conflation of Warner Bros. exposé and Metro spectacle, albeit with one of the truly great stars. Light fare from Robinson’s most prolific period. Read the biography of Edward G. Robinson I wrote for the Film Noir Foundation’s Noir City magazine at this link. Starring Edward G. Robinson, Ruth Hussey, and Gene Lockhart.